Is this the face of Cardoso? It is reported that King John IV of Portugal, an admirer of Cardoso’s music and supporter of his publications, kept his portrait hanging in his library (so the preface to Portugaliæ Musica tells us), but we have to assume that this was destroyed along with the library in the Lisbon earthquake of 1755. Yet, a simple Google image search for Cardoso brings up this portrait, which also adorns his Wikipedia, CPDL and IMSLP pages. The painting is Portrait of a Young Gentleman (1600s) by Domenikos Theotokopoulos (better known as El Greco due to his Greek heritage). El Greco painted numerous named portraits, none of which is Cardoso, and there is no reason to suppose that he, living in Venice, Rome and, from 1577, Toledo in Spain, would have met or even heard of Cardoso. 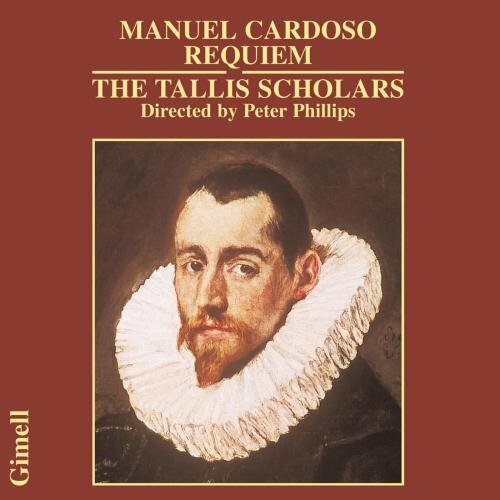 The Tallis Scholars’ recording of Cardoso’s 6-voice Requiem used this portrait as its cover and this appears to have been misunderstood by others as being a portrait of the composer. El Greco had sought to gain King Philip IV of Spain’s patronage, but the two royal commissions he did secure were not favourably received, effectively destroying that hope. By contrast, Cardoso was well-respected by Philip who provided him with a theme which became the basis for the six Missæ Ab initio, the sixth of which was the final Mass of our Cardoso450 project, as well as a theme for the Missa Philippina. Together with the plainchant-themed Missa de beata Virgine these Masses make up Cardoso’s 1636 Liber tertias missarum which he dedicated to Philip. The very lack of connection between Cardoso and El Greco via Philip IV is an opportunity to reflect on the precious little information we have about Cardoso and so many other Renaissance composers who live now almost exclusively through their music. El Greco’s anonymous portrait may have served as an erroneous image of Cardoso; we are fortunate at the Carmelite Priory to have gained a more vivid image of him through having performed his Masses and motets during the last two years. The new music list is now available. It is not only the final list of 2017, but also the end of Cardoso450, a project that has been a constant companion since February 2016. Cardoso's 6-part Requiem was one of the works that encouraged the project into existence; it is fitting that it should be one of the final works we perform. But what of the rest? We're entering the final stages of our monumental Cardoso450 project, building up to the big finish on the Q4 music list. Our Cardoso focus allows us to explore another Palestrina/Cardoso pairing on Sunday 16th June - Veni sponsa Christi for our Patronal Feast of Our Lady of Mount Carmel. Another interesting pairing can be heard on 20th August with two settings of the story of a woman whose daughter is possessed by a devil (Matthew 15: 21-22). This list also has a strong English accent with music by Byrd, Mundy, Philips, Tallis and Tye, a foretaste of our forthcoming project in 2018/19 - more details soon. We're particularly excited to be able to perform Holst's 8-part Ave Maria for upper voices and two motets by Sweelinck whose sacred music is heard far too infrequently. The music for Easter and beyond is now available here. The music list for January-March is now available here. Beyond Cardoso, two double-choir settings of the Marian antiphon Ave Regina cælorum particularly stand out: the setting by Joan Cererols is notable for the effortless conversing of the two choirs and for its stunning concluding English cadence; and Michael Haydn’s setting, written in the stile antico, which contains numerous harmonic twists and turns that make it a happy partner to Mendelssohn’s Mass for eight voices, an arrangement of his vernacular Lutheran settings.